When we moved into our previous home, we inherited a glass top stove with the house! This stove wasn't new…the top had some scratches on it when we got it. I decided to try to find an easy way to clean a glass top stove since it was all new to me. It actually is possible to keep a glass top stove looking great without a lot of effort! I like to multitask and this doesn't always work out for me. Sometimes my multitasking ends up with something boiling over! This can cause a lot of problems with a glass top stove…more than I had with my traditional stove. When I began looking for solutions I found some great information over at TidyMom! The best part of this recipe for a shiny glass cook top is that it doesn't involve a lot of ingredients…really only baking soda! I grabbed some baking soda, an old towel and a bowl . First you want to run some HOT water….as hot as you can stand it. I put my bowl in the sink and filled it with hot water and put my towel in there. Next you want to pour the baking soda all over the stove top. Put plenty on there. Next you will wring the wet towel out a little…you still want it pretty wet…but not totally wet! 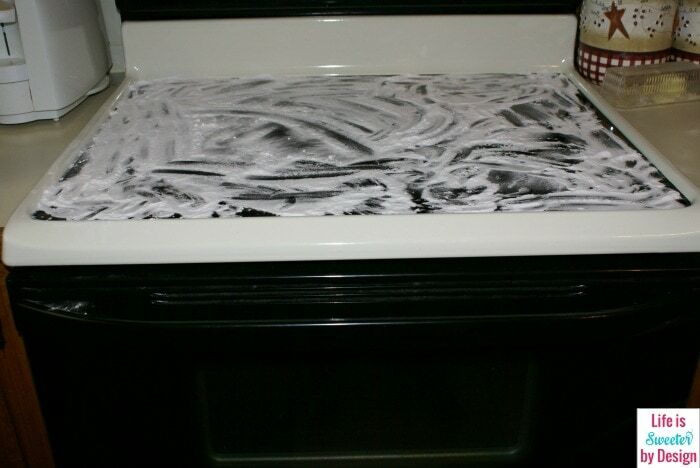 Lay the wet towel over the stove top, covering the baking soda. Just let it sit there for 15-30 minutes. You can add more hot water to the top of the towel midway through it you want. Once your time is up you can use the towel and wipe the stove top in a zig zag pattern. You can put a little extra effort into problem areas. If you would like to use a sponge (not the abrasive side) you can use that to finish cleaning off all the baking soda and any debris you may have loosened up. If there are any areas that are still stuck on, you can use a nylon pot scraper to loosen those areas. Once you are finished cleaning the stove top you can buff it with a microfiber cloth . If you see any streaks use a little glass cleaner . Overall I felt that this method worked really well. It wasn't too labor intensive. It used items I had on hand. My stove top looked great when I was done. 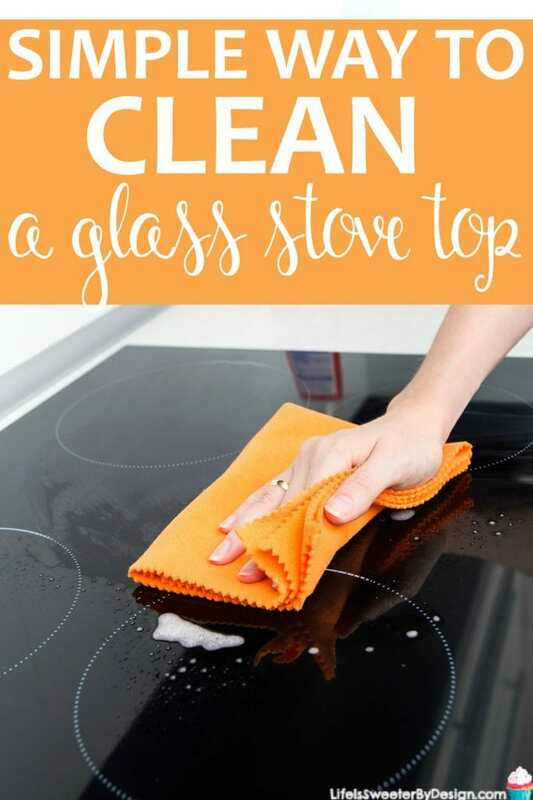 I think that using this method once a week will really keep my glass stove top looking its best! How do you clean a glass stove top? I would love to hear your tips and tricks! 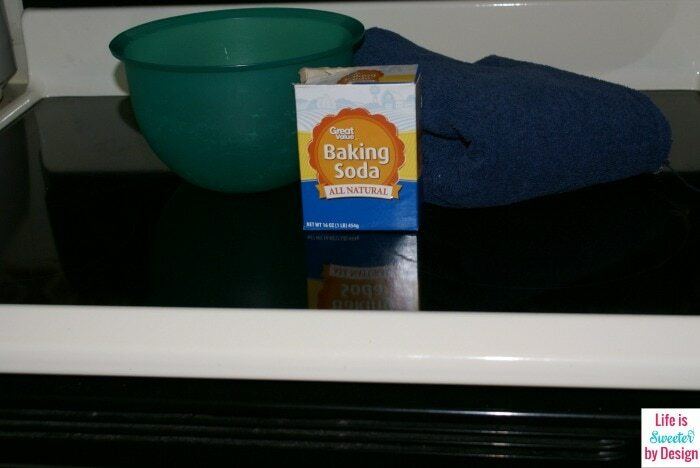 Is this DRY banking soda on the stove top, or do you make a PASTE of soda to cover the cook top? Your photo looks like it is wet. This is dry baking soda…I agree that in the picture it kind of looks wet, LOL! You just put a nice layer on there dry and then lay the wet towel on top! Thanks so much for stopping by!! You should never use glass cleaner on a range cooktop. Most instructions will say that. Glass cleaner is much to harsh for the glass used on a cooktop. So the best thing to do is soap and water, or your baking soda method. Please stay clear of store bought glass cleaners.